Seven men of the Florentine nobility were involved in the brotherhood of "Laude" to venerate the Holy Virgin Mary. On the day of the Feast of the Assumption, the Blessed Virgin appeared to them to urge them to make their lives even more holy and perfect. They decided to follow the advice of Mary and left the business world to retire to a life of prayer and penance, especially giving themselves over to the veneration of the Virgin Mary. On Good Friday, in 1239 Holy Mary appeared again and showed them a black cassock that in future they should wear, with what would motivate them to establish a new religious order. The Order would spread especially the veneration of the Sorrows that the Blessed Virgin bore with the Cross. Thus arose the Order of the Servants of Mary, Servites, or the Friars of the Hail Mary, who found rapid and wide dissemination. The seven founders of the Order of the servants were all canonized: Bonfiglio Monaldi, John of Buonagiunta, the Amedeo Amedei, Marietta dell'Antella, Support supports, Hugh of Uguccione and Alessio Falconieri. 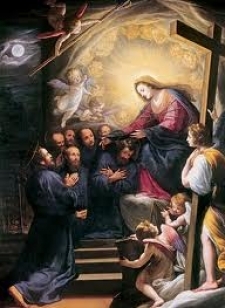 On August 15, 1233, Our Lady appeared to seven noble Florentines, who had joined the brotherhood of "Laude", inviting them to retreat from the world and to choose the contemplative life. Good Friday in 1240 the Virgin, dressed in mourning and surrounded by a bevy of heavenly spirits, they appeared to show a black cassock, they would have to wear, thereby pushing them to found a new religious order: the Order of the Servants of Mary. In fact, one of the angelic spirits would hold a paper in gold letters that read: "Servants of Mary," while another had in his hands the rule of St. Augustine, and a third was waving palm tree, symbol of victory. Mary would say to them: "Take this dress for mourning and bring it in memory of my sorrows. Receive the rule of St. Augustine. Continue to be my faithful servants by practice of the virtues propagated everywhere devotion to my pain and you will get a day this palm of eternal life. " In 1250 the brothers built a new chapel dedicated to the Annunciation. The painter who was painting the picture of the Virgin was struggling to finish it: he did not know to paint the face. One night, awoke from his sleep, he found miraculously painted. The seven served, or brothers of the Hail Mary (Bonfiglio Monaldi, John of Buonagiunta, of Amedeo Amedei, Manetto dell'Antella, Support of supports, Hugh of Ugaccione, Alessio falconers), were all canonized. Posterity has wanted to worship together, these seven men, as they had lived together in brotherly love, and together they were proclaimed saints in 1888 by Pope Leo the thirteenth. They spread, especially, the veneration of Mary bore the pains at the foot of the Cross. Diocese: Florence - Tel 055.40.64.41 / Schedule: The Feast of the Seven Founders falls on 17 February. The shrine-monastery of Monte Senario, is located at 815 meters, in a panoramic position, and is reached by a winding stretch of road: here was established the order of the Servants of Mary. On August 15, 1233 seven noble Florentines were sent by the Virgin to leave everything to follow his will gathered on the mountain top to enjoy a life of penance and prayer together. On Good Friday 1240, contemplating the Virgin of Sorrows surrounded by heavenly spirits, were invited by you to participate in its pains and follow the rule of St. Augustine. They did an act of consecration to Our Lady, adopting the title of his "servants," according to a particular status of life, then ordained priests, who founded the Order of the Servants of Mary, which was approved on 11 February 1304. In 1594 the monastery was rebuilt. In 1649, during the reconstruction of the main altar were found the remains of seven bodies: the heads, placed in a golden urn, were moved to January 10, 1700 under the altar of the chapel called the Apparition, which became Shrine of the Seven Founders, January 15, 1888 canonized by Pope Leo XIII. In 1789, after a new survey, bones and ashes were placed in an urn of marble at the back of the chapel and the heads placed under the altar of the same altar. On August 15, 1933, bones and heads, gathered in one reliquary, were transferred to the chapel of the Seven Saints, on the occasion of the seventh centenary of the order. ur Lady of Sorrows is an invocation of the Virgin Mary, the Servite related, often depicted with Jesus dead on his lap, after the descent, sometimes with an expression of grief at the foot of the Cross, holding the crown seated Spines of his son. Servite dress with a black habit for the night of Good Friday 1240 he appeared the Virgin dressed in black habit, ordering them to be adopted as a mark of the new Order, to serve as a reminder of the pain she suffered in the passion of her Son. Your image is in procession during Holy Week in many Spanish towns and is the patron of many peoples. Our Lady of Sorrows in Murcia parade Friday night in the "Procession of the Servite", walking streets lined shoulders a faithful turned solemn passage of the Virgin. The black color of the robes of his brothers and tinged with mourning penitents Murcia spring for over two hundred years ago, being one of the most emotional of those parades are held in the capital. The Order of the Virgin Mary, popularly known as the Servites, was founded in Florence in 1233 for seven merchants whose greatest desire was to achieve Christian perfection, with emphasis on devotion to the Blessed Virgin. Buonfiglio dei Monaldi, Giovanni is called Buonagiunta di Bartolomeo degli Amidei, Ricovero dei Lippi-Ugguccioni, Benedetto dell'Antella, Gherardino Sostegno and Alessio di Falconieri. They decided to pull out of the city of Florence to lead a contemplative life cenobítica and, finally, they settled near Mount Senario, which was about 18 kilometers around the former city. The people of Florence, admired for his exemplary life and ardent devotion to the Blessed Virgin, began calling the "Servants of Mary." Soon this small group joined some pious lay Florence, eager to imitate his way of life. It was then that he decided those ancient traders go to Florentine bishop Ardingo, to allow them to admit to, thus constituting a new religious institution. Obeying the provisions of the Fourth Lateran Council, chapter 13, chose the Rule of St. Augustine with their constitutions, which were premostratenses through the recent drafting of the Dominicans between 1239 and 1241. From 1250 the new religious organization qualified his eremitical character, emphasizing the cenobítico and apostolic. Get the first papal recognition by Pope Urban IV in 1263, renovated in 1265 by Clement IV. Under Pope Gregory X at the Council of Lyon (1274) the decretal "Religionum Diversitate" was written, limiting the number of the mendicant orders. With this document endangered the existence of the Order of the Servites. S. Philip Benizi, General of the Order, came to his defense, and after that, in 1290, a new papal recognition was granted. Final approval was Benedict XI through the Bull "Dum levamus" of February 11, 1304. Since its founding, the main feature of the Order was the devotion to Our Lady, especially in consideration of his sufferings at the foot of the cross of Christ, and its members who have contributed to its spread. This devotion has a solid foundation in the Gospel, based on contemplation and meditation on the Passion of Christ. But only towards the end of the eleventh century that begins to assert itself in a more concrete way. This spontaneous devotional movement finds its greatest support from Servite. They dress as a black habit, as he relates the Legenda of origine Ordinis Servorum, the night of Good Friday 1240 the Virgin appeared to them dressed in black habit, ordering them to take as a sign of the new order, to serve them reminder of the pain she suffered at the passion of her Son. From the thirteenth century began to represent the Virgin Dolorosa, emerging, while shrines to this title, as in Marienthal, near Haguenau in Alsace low. In this century there were numerous compositions in various languages, in prose or verse, titled "Crying Lady". During the thirteenth and fourteenth centuries begin to place the seven sorrows of Mary Main, parallel to the seven known joys of the Virgin. According to Benedict XIV, this custom was due to the Seven Holy Founders of the Servite Order. It was they who began to replace the sword through the heart of the Virgin, according to the prophecy of Simeon, the traditional seven. This time is the composition of "Stabat Mater", attributed to Jacopone Todi. The liturgical commemoration of the sorrows of the Virgin of Passion Friday did, but Innocent XI in 1688 instituted a second party outside Lent, securing the third dominica September. St. Pius X changed to the 15th of the same month in 1914. From the earliest times, some lay people, eager to revive the spirit of the Servite Order, but at the same time maintaining their lay status, they decided to link to it through the Venerable Third Order of Our Lady of Sorrows. It was not a Brotherhood, as third orders occupied a middle ground between the religious congregations of simple vows and Guilds. Differed from those in lack of the three vows of poverty, chastity and obedience, and Guilds in having Rule approved by Pope, novitiate, profession and own habit. In the beginning company or consortium of Servite, denominating first Third Order in 1497 was called. Its regulation was determined by the Bull "Providentia Apostolicae Sedis", given by Martin V in 1424, subsequently endorsed by Innocent VIII in 1487, by the Bull "Mare Magnum". This legislation to the Venerable Third Order remained in force until the twentieth century. With the entry into force of the renewed "Rule of Life" from February 17, 1983, the Venerable Third Order began to be called Secular Order of the Servants of Mary (OSSM). The Venerable Third Order, in principle, could be established only in churches or oratories governed by the Servites. However, in the cities where it was not established, it allowed the General Order that could be erected in any temple, always to tell with the permission of the local Ordinary. But at the same time, it was required that away from the nearest at least two leagues. Your organization and conduct of the pious exercises are especially based on the manual published by Father Lorenzo Reymundínez in 1687, entitled congregant and perfect servant of Our Lady of Sorrows. In San Bartolomé (Murcia) was a great devotion to Our Lady of Sorrows, which had increased with the presence of the exceptional size of the Virgin of Sorrows, completed by sculptor Francisco Salzillo in 1740.
Who also ran the parish D. Casimiro Sanchez de Leon, zealous pastor and great devotee of the Virgin of Sorrows. Possibly started a kind of Venerable Third Order of Our Lady of Sorrows, who came not to mature, perhaps not agree with what is required by the Venerable Third Order Servite; thus not could you profit from the numerous indulgences granted by the Fries Order. It follows Censorship Morote and Fray Francisco Guerrero, Warden of the College of the Immaculate Conception of Murcia, the book written by José Antonio saved, entitled School of Our Lady of Sorrows, the Warden of the College of the Immaculate speaks of "Congregation of the Servants of the newly erected Dolores at the Parish Church of St. Bartholomew Lord of this city of Murcia ...". Instruction also the congregants of the Servants of Mary Sore, again based on the famous parish church of St. Bartholomew Lord of Murcia, co written by the sub-rector José Antonio saved, cleric of St. Bartholomew. This time D. Casimiro wrote to General of the Servites Fanfeli Fray Juan Pedro, who was in Rome, he replied giving the erection of the Congregation of the Servants of Sorrows St. Mary in the Church of St. Bartholomew, naming perpetual corrective pastors of the Church said. The grant was signed in the Convent of San Marcello in Rome, dated November 13, 1754. Erection solemnly performed Amurrio and Nicholas D. Junguitu, inspector general of the diocese, on behalf of Bishop Diego de Rojas Contreras. Murcia were many that were linked with enthusiasm to this new congregation, including the chaplains of the parish clergy and distinguished people of the City. Eligiose for beginning this foundation afternoon March 19, 1755. Over one hundred and fifty brethren met at four o'clock to own cults of the Congregation. were initiated with a fervent talk of D. Casimiro Sanchez de Leon, in which he expressed the powers of the General of the Order had him granted for the founding of the Congregation of the Servants of Mary in the chapel Distressed Virgin of Sorrows and graces and indulgences granted to the congregants. He then gave each congregant the black scapular and painful crown. In response, the new members made the profession in the hands of the pastor. Ten months later, the congregation had nearly eight hundred members of both sexes. St. Bartholomew's Church, located in the historic center of the city of Murcia, houses one of the most venerated Marian images by its inhabitants: the Our Lady of Sorrows. It is a fully Baroque polychrome carving and gilded wood, depicting Mary holding the lifeless body of Jesus Christ at the foot of the Cross, the sculpture completanto four angels accompanying the Virgin in this highly charged and dramatic representation of pain. The work was done in 1740 by the famous Salzillo, who was commissioned by the Brotherhood of Servite. Its beauty and anatomical perfection is undeniable, making it one of the best examples of this passionate icon exist throughout the world. From the moment the size is acquired, the Virgin of Servite begin to take part in the Easter parades of the city, they emerged with the growing fervor of Murcia to this Marian devotion. In 1797 it would be enthroned in a beautiful baroque chapel that purpose was built in the temple of San Bartolomé, it currently occupies and where is worshiped throughout the year. It would even be named guardian of the guild of silversmiths, merchants have traditionally developed their activity in the streets around the church. Clement XII granted plenary indulgence to those who visit the shrine of Our Lady of Sorrows during Palm Sunday. And in 1830, another Pius VIII granted a plenary indulgence to all who made it from the eve of Good Friday until sunset on such day, when his feast is celebrated. Lifesize sculpture in polychrome wood to wear, head, hands, forearms, legs and feet fully embodied, the rest is a anatomized body and covered by a leaden blue polychrome flat. Its provenance and distinctive modeling, let us ascribe to the Seville school of the eighteenth century. Originally formed another angel group with similar morphological characteristics but genuflexa position, but also in attitude of having something in their hands, most likely a shroud, which makes us think that it would stand a Christ, representing the Holy Sepulchre. The graphics of the face and flesh tones (of frescores rosy), treatment of internal morphology, as well as details of the mobility of the wings, we refer to similar solutions provided by the famous sculptor Pedro studio Sevillian Roldán, most likely case a work of one of the many disciples, followers and followers of his school. Allegorical figure of the passion and life of the Mother of God, for in every evangelical highlight of Mary, there is the figure of an angel at his side, carrying in his hand a scapular of the Brotherhood and a crown of thorns plant. Angel pasionario recovery has been a way to pay tribute and rescue the Angel of Passion on record their participation since the eighteenth century in a sculptural group known as "Exaltation" but, is uninterrupted since 1878 until 1931, as such, who accompanied the Virgin of Sorrows in transfers that were made Passion Saturday to the Church of San Bartolomé. These transfers were in town, solemn procession treatment given the multitude of ladies dressed in Spanish mantilla and wax that accompanied the procession with horse guard procession and opening choral passage behind the head of the Virgin. It seems that the Brotherhood did not have a picture of the angel, but used either one of the angels of Salzillo Francisco, San Juan de Dios, or disappeared Guardian Angel, St. Nicholas. Currently her wardrobe consists of several teams, adapted to the different liturgical seasons and celebrations, highlighting the usually looks at the Good Friday procession, designed by renowned Valencian artist Pedro Arruda de Mora, executed in rich brocades and Valencia spurs. Queen of Martyrs, sweet mother! sores your son and his bloody cross ..
because my sins rebuke me my ingratitude and cruelty.